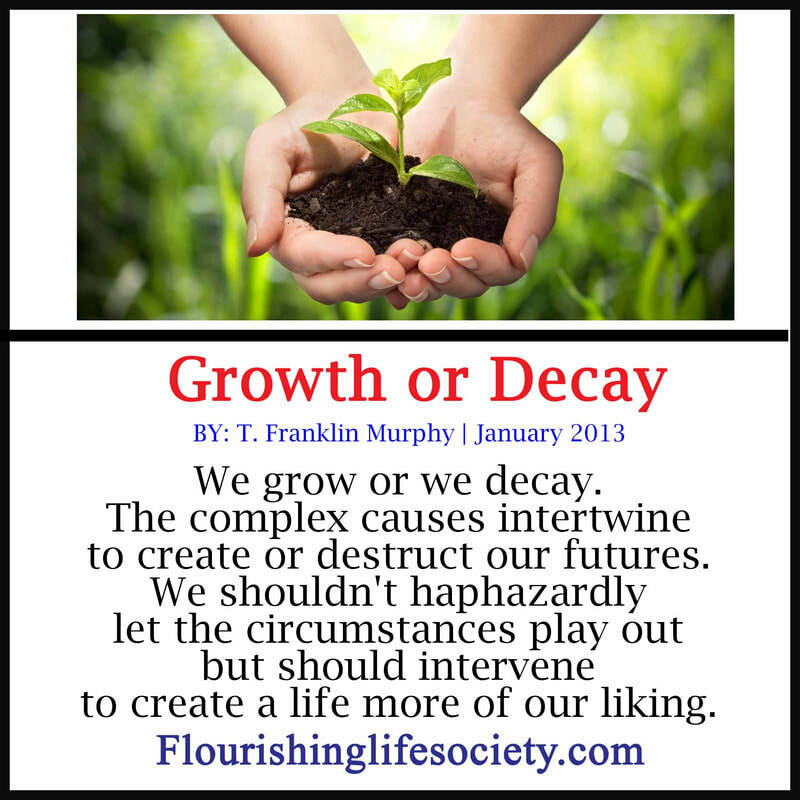 We grow or we decay. The complex causes intertwine to create or destruct our futures. We shouldn't haphazardly let the circumstances play out but should intervene to create a life more of our liking. “I failed; but it’s not my fault.” We scream in self-protecting rhetoric. We tend to take credit for good and blame others for bad, errantly assessing experience. We feel competence where we are weak, encouraging dangerous ventures into the unknown. Assessment errors create greater vulnerability. We blindly enter undertakings where we are over matched and unprepared. Newness to experience, even when properly prepared, always has a few surprises. We do our best to prepare for novel experiences, rooting out biases and arming ourselves for the unseen battles. Flourishing demands facing challenges, adapting to complexity and emerging victorious. Standing tall in the presence of the unknown is a terrifying necessity for future success. We never know how the future will unfold; unseen risks always interrupt the intricate plans. Life’s not perfectly predictable. We must adopt contingency plans, maintain enough flexibility to stop, examine and adapt. Occasional Failure is inevitable but gathering wisdom from those failures is optional. To gain wisdom, we must accurately assess failures, identifying involved factors, and improve future contributions. Our ego fears these unbiased investigations that often uncover personal failures. We feel relief by washing away personal responsibility by self-righteously pointing a finger at someone else. But relief is bought for a cost, risking the repeat of the same destructive behaviors. "Occasional Failure is inevitable but gathering wisdom from those failures is optional." Events don't just happen. Life is not random. There’re always reasons behind the final product. We sadly live in a world full of violence. The senseless beating of an innocent victim doesn’t magically materialize from nothing; the dastardly act is contingent upon a string of proceeding causes. The road leading to the violent crime starts many years before the final culminating event. The perpetrator’s experiences and choices slowly intertwined with biological givens molding his present character. His life slowly changed with each set of exposures, choices, and consequences. These happenings are magnified by his interpretations, creating the sensible story to organize the inputs. ​A criminal typically doesn’t see themselves as bad. They create a story that justifies their badness, exaggerating the instigating factors and dismissing personal choice. The seemingly small threads weave together, creating the underlying emotions that motivate behaviors, building a growing disinterest in others, and weakening self-discipline over passions; the innocent child transforms into a violent man, senselessly administering hurt to others. The final senseless beating was not a difficult choice, but the climax of many insignificant actions, slowly paving the path to destruction. We are in a process of becoming something. Most visitors to this website dedicated to flourishing are unlikely to senselessly assault. But we are part of a similar process. Our histories, ethics, and biological make-ups set us on course to become something. Erich Fromm taught we fall into two general categories. We can be lovers of life involved in continual growth or indifferent to life and are in the process of decay. Growth is natural when kind elements abound, surrounding our souls with nutrients and gentleness. Harsh environments destroy. We curl into ourselves to protect from the damaging elements outside. When biological givens are graced with nutrient-providing climates, the organism fulfills its destiny. Our thoughts are active ingredients in forming the surrounding environment. Our choices further refine or destroy the conditions. The mundane choices of friends, activities, and thoughts are important. All these little choices ultimately support growth or invite decay.